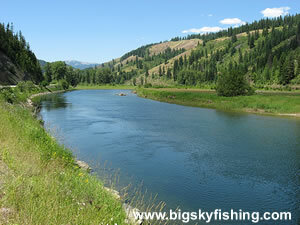 The St. Joe River Scenic Byway is a scenic byway in Idaho. This byway is a “State Designated” Byway. What this means is that the Idaho state government, in an effort to promote tourism, has pretty much labeled ALL highways located anywhere near a mountain or anything else interesting a scenic byway. While some of the byways in Idaho are rather lame due to the rather “lax standards” that go into determining what should be a scenic byway, the St. Joe River Scenic Byway is an exception. Since the St. Joe River Scenic Byway is an Idaho creation, the route technically only runs in Idaho. However, the routes eastern starting point is actually St. Regis, Montana. Although the Idaho portion of the byway is much more scenic than the Montana section, since the eastern beginning point is located in Montana, I felt it should be included in the Montana Scenic Drive section of Big Sky Fishing.Com. The Idaho portion of the St. Joe River Scenic Byway is an 89-mile, remote journey that closely follows the St. Joe River in northern Idaho. This section of the Byway runs between St. Maries, Idaho and the Idaho/Montana border. The first forty-seven miles of the Byway, between St. Maries and Avery, follows Idaho 50, a paved highway. To the east of Avery, the Scenic Byway enters the St. Joe National Forest and the road turns to gravel. By contrast, the Montana portion of the Scenic Byway is, to be honest, forgettable. This short section passes through thick forests that have seen heavy logging. Happily, the road is in good condition and, perhaps best of all, it’s only 17-miles to the Idaho border. Beginning in St. Maries, Idaho, the St. Joe River Scenic Byway heads east on State Highway 50. The Byway closely follows the St. Joe River as it passes through low, forested hills that have seen plenty of logging in years past. Yet, the waters of the St. Joe River are clear. And while the terrain is heavily forested, there are plenty of small, open meadows along the river that provide excellent views of the surrounding landscape. The Byway only passes by two towns on its 106-mile journey to St. Regis, Montana. The first town is called Calder, which has a general store and perhaps a few other things. The second town is Avery, which is located right on the St. Joe National Forest boundary. Avery also has a general store along with a few other tourist things. Just be aware that prices for gas and supplies are very high in these towns. Thus, it’s best to stock up on gas and supplies either in St. Maries or St. Regis. To the east of Avery, the St. Joe River Scenic Byway enters the St. Joe National Forest. The road turns to gravel and the forested hills become larger and “closer in” to the byway and the St. Joe River. The Byway continues to follow the St. Joe River closely for about 35 miles before it leaves the river behind and starts to climb up the mountains that form the Idaho-Montana border. The climb is steady but not horrifyingly steep, and vehicles with trailers should encounter no problems during normal conditions. The pass the Scenic Byway crosses into Montana is hardly awe-inspiring, as this area has seen significant logging activity in years past. Additionally, the mountains in this area have a low-elevation, so don’t expect to see the towering peaks found elsewhere in Montana. Still, there’s enough open vistas around the pass that provide some pretty, if not exactly overwhelming, views. 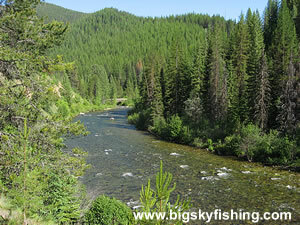 From the pass on the Idaho-Montana border, the Byway follows Little Joe Road down to St. Regis. The road, although gravel, is wide and is generally in good condition. Overall, the St. Joe River Scenic Byway is an interesting drive. Those wanting to see soaring peaks and open vistas will likely not enjoy the drive. However, the remote setting of this part of northern Idaho, the sheer length of this backcountry drive, and the very clean waters of the St. Joe River, make the St. Joe River Scenic Byway an enjoyable trip for those who enjoy driving through remote, forested terrain. Season : Seasonal between Avery and the much of the Montana portion of the drive. Otherwise, open year-round weather permitting. During the winter months, the closed portion of the drive is used for snowmobiling. The map below shows the route and location of the St. Joe River Scenic Byway in Idaho and Montana. The route travels between St. Maries, Idaho, and St. Regis, Montana. There is a general store along the St. Joe River Scenic Byway in Calder. The town of Avery also has a place to buy supplies, gas and, I think, there might be a small, seasonal motel there (but don't hold me to it!). Camping spots along the Byway are abundant. The route passes through significant tracts of federal land. Many developed campgrounds are located right along the St. Joe River. Additionally, primitive camping spots are also abundant once the Byway enters the St. Joe National Forest to the east of Avery.